After a holiday weekend of indulging in some delicious food, I was ready to lighten up our meals this week and do a bit of detoxing from the last few days. 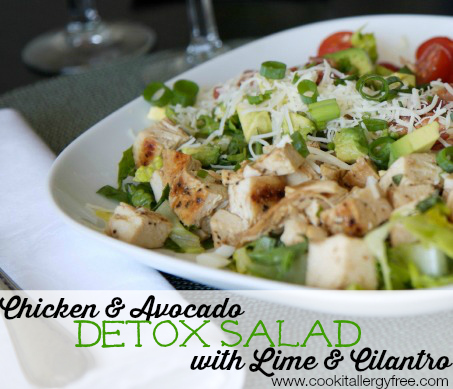 This gluten-free and dairy-free Chicken and Avocado Detox Salad with Lime and Cilantro is a favorite simple dish around here. It is quick to throw together and is a perfect lighter meal as the days are starting to warm up. It also has a number of ingredients that are wonderful for our health AND for cleaning out our systems after maybe a bit too much of that holiday candy! Cilantro: contains powerful natural cleansing agents. Cilantro has strong antioxidant activity, has been shown to have anti-anxiety effects, and is also a surprisingly good source of Vitamin K.
Juice from Limes and Lemons: contain unique flavonoid compounds that have antioxidant and anti-cancer properties. Lemon or lime juice helps stimulate and regulate the digestive tract and therefore helps with constipation, heartburn and gas. All of the antioxidants, minerals, and vitamins present in these citrus fruits help to loosen toxins in the digestive tract and also flush out water retention by increasing urination, thereby eliminating toxins at a faster rate. Avocados: contain in excess of 25 essential nutrients, as well as fiber, healthy fats, protein, and beneficial phyto-chemicals. They can also help to regulate blood sugar levels, protect against cancer, and help fight free radicals. These ingredients have so many other benefits as well, but I will leave you with the few that I like the most. Hmmm…maybe I should also offer this Detox Salad up to our little egg-hunting pup. He probably could use a good cleansing of his system after stealthily finding some of those eggs that the Easter bunny so carefully hid so that he wouldn’t. 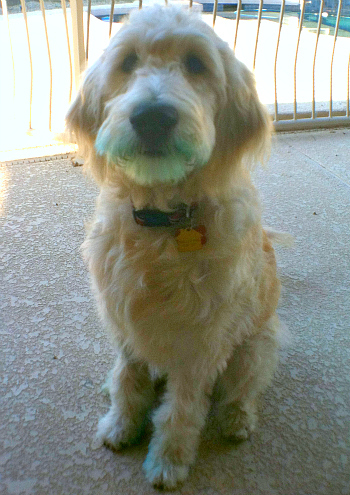 If you look closely at his face, you will notice how, when a dyed Easter egg is chewed on by a dog, the said dye does not technically remain on the egg. 1. Toss diced avocado pieces with the lime juice and sea salt. 2. Mix lemon juice and mayonnaise (or yogurt) for the dressing. 3. Place diced or shredded chicken in a large bowl. Add avocado mixture and green onion slices. 4. Add lemon juice and mayonnaise mixture and toss everything gently together until coated. Add cilantro and cherry tomatoes and toss again until just barely coated. 5. Taste for seasonings and add more sea salt to taste if needed. 6. Can be served at this point or chilled for later. If you are needing something a little bit heartier to clean out your system and get you on track for the upcoming summer months, here is a quick 2-day detox that is packed with WHOLE FRESH FOODS. These recipes will get you on track to feeling healthier, looking leaner, and jump-starting that metabolism as we all get ready to pull out those shorts and sundresses for summer! Right now Get Lean Gluten Free is offering this 2-Day Cleanse with the shopping list, recipes, and everything you need for only $7.95. Just enter code SUMMER20 at check out and you are good to go! LOVE this salad. A touch of crispy thin pancetta or prosciutto would be a salty topper but not in line with a detox. You have all my favs in here! The salad sounds DELICIOUS! 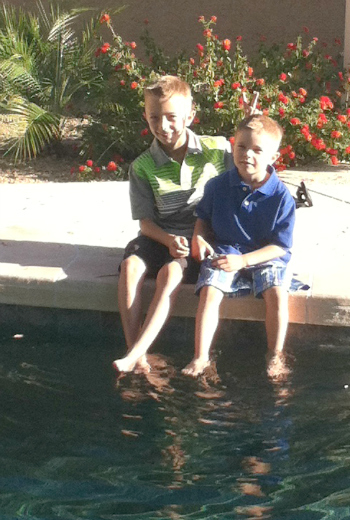 but the boys are precious. Love the new look on Quincy. This is his first Easter! Something more to celebrate. I would love this salad whether in detox mode or not. 😉 But I appreciate all the great info on its nutritional benefits, Kim. Thanks! Not only do I bet there wasn’t a bite left but that your kids beg you for detox meals daily. I also wish I could spell “ad olive oil” I should have appended a brand name. That should be “add.” Thank you and good night. Love the recipe Kim – you’ve reminded me to put avocado on my shopping list!